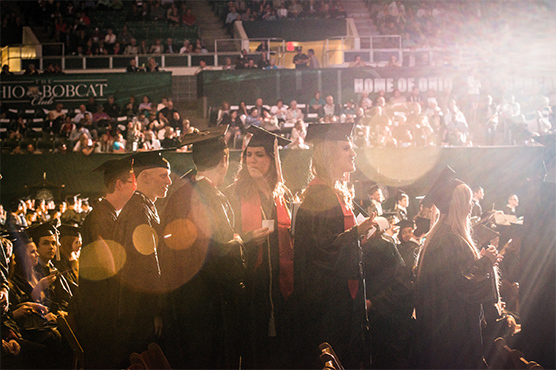 Commencement exercises are held indoors in the Convocation Center, located on the west green of the Ohio University Athens campus. Tickets are not required for any ceremony and the ceremony lasts approximately 2.5 hours. Candidates must assemble in the Convocation Center garage area no later than 8:45 AM. Signs will be placed throughout the garage area indicating each college's location. Candidates will form a single line behind the appropriate sign. Candidates will receive a name card in the garage area which they must keep with them until they are called to the platform for recognition. Graduates will exit the area after their name is called. Tickets are not necessary for this ceremony. Located in the Amanda J. Cunningham Leadership Center Room 366, 3rd floor of Baker University Center. View the cap and gown page for more ordering information. Pick up your cap and gown during distribution. Inform family and friends of ceremony dates and times. 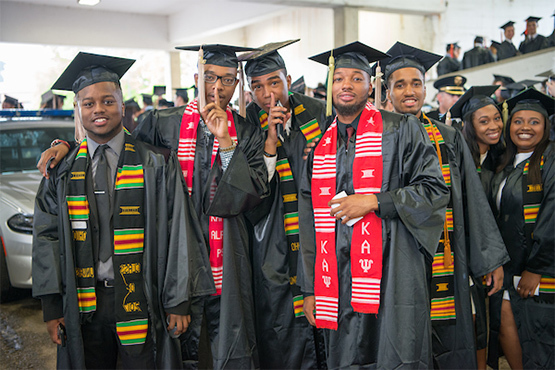 Arrive to the Convocation Center garage no later than 45 minutes prior to the start time of your ceremony.